2010 in: Stauffenburg Einführungen No. 20, Tübingen: Stauffenburg Verlag, 512 pages (second, modified edition 2013, 549 pages). ISBN 978-3-86057-805-6: 29,80€ bei Stauffenburg oder Amazon.de. 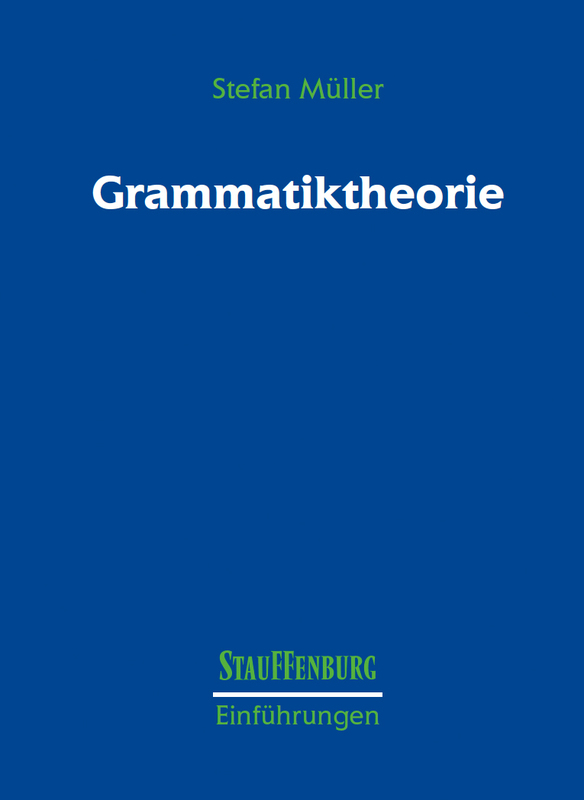 This book introduces formal grammar theories that play a role in current linguistics or contributed tools that are relevant for current linguistic theorizing (Phrase Structure Grammar, Transformational Grammar/Government & Binding, Generalized Phrase Structure Grammar, Lexical Functional Grammar, Categorial Grammar, Head-Driven Phrase Structure Grammar, Construction Grammar, Tree Adjoining Grammar). The key assumptions are explained and it is shown how the respective theory treats arguments and adjuncts, the active/passive alternation, local reorderings, verb placement, and fronting of constituents over long distances. The analyses are explained with German as the object language. In a final chapter the approaches are compared with respect to their predictions regarding language acquisition and psycholinguistic plausibility. The Nativism hypothesis that assumes that humans posses genetically determined innate language-specific knowledge is examined critically and alternative models of language acquisition are discussed. In addition this chapter addresses issues that are discussed controversially in current theory building as for instance the question whether flat or binary branching structures are more appropriate, the question whether constructions should be treated on the phrasal or the lexical level, and the question whether abstract, non-visible entities should play a role in syntactic analyses. It is shown that the analyses that are suggested in the respective frameworks are often translatable into each other. The book closes with a section that shows how properties that are common to all languages or to certain language classes can be captured. Downloading this book is free. The book will remain freely available once it is published. The price of the book will be 29,80€, which is very low. If you want to work with the book seriously, you should buy it. The electronic version will be a valuable extension. Alternatively you may also buy the e-book for 19,80€ to support the publisher. Most of the book is already translated to English. The English version will be published by Language Science Press next year. Review by Helga Pető-Szoboszlai in Sprachtheorie und germanistische Linguistik, 22.1, 2012, p. 88–92.